The Church of St Anne in Shandon on Shandon Street is home to the famous Shandon Bells, built in 1720’s it is one of Cork’s most famous landmarks. The design of the building consists of a square tower surmounted by a lantern, on top of the lantern is a copper dome with a gilded weather vane in the shape of a salmon. Two sides of the tower are made from red sandstone and the other two are made from limestone. The four-faced clock, made by James Mangan of Cork, was erected by Cork Corporation in 1847 and had been known as "The Four Faced Liar" ( also "The Four Liars") as the clocks never agreed. According to tourist guides this problem has been rectified but some of my photographs show that some of the clocks do not agree. The Firkin Crane building was designed by Sir John Benson and opened in 1855. The building is a unique rotunda, which formed part of Cork’s original Butter Exchange. 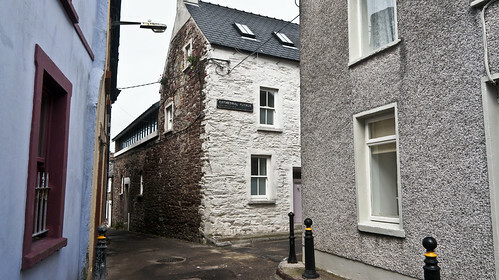 This building forms part of an interesting group of related structures with the former butter market buildings in the Shandon area. The butter trade originating from Cork City in the eighteenth and nineteenth centuries stretched to Great Britain, Europe, North America, the Caribbean, and the West Indies. Indeed the building’s name derives from Danish words pertaining to measures of butter. Firkin is a Danish word meaning quarter barrel and in former times these firkins or casks were tarred and weighed on a balance known as a crane.